This rich and creamy vegan chocolate chia seed pudding is naturally sweetened, packed with health benefits from the superfood chia seeds, and is the perfect romantic dessert for any special occasion. This post is sponsored by Bob’s Red Mill; however all opinions are my own. Every time I eat chia seed pudding, I feel like I’m doing myself a favor. “Thanks for eating dessert, Julia. You’re a real pal!” Pat on the back. Fist bump. In all seriousness, the health benefits of chia seed pudding are worth hemming and hawing over, because: omega-3 fatty acids + antioxidants + Vitamins and minerals. Chia seeds are super dense in Omegas, plus full of fiber and antioxidants. Ergo, chia seed pudding is one of those treats I thank myself for. Chia seed pudding has a similar consistency to tapioca pudding. When soaked in liquid, chia seeds plump up and form a sort of thick gelatinous substance around them, which makes for a thick and creamy pudding. The chia seeds themselves have a similar texture to tapioca, but the seeds are smaller. I always forewarn my “texture” friends before they dive in, but those who welcome all textures are usually very receptive to the chia pud. This recipe is as simple as can be and includes nothing but great-for-you ingredients. 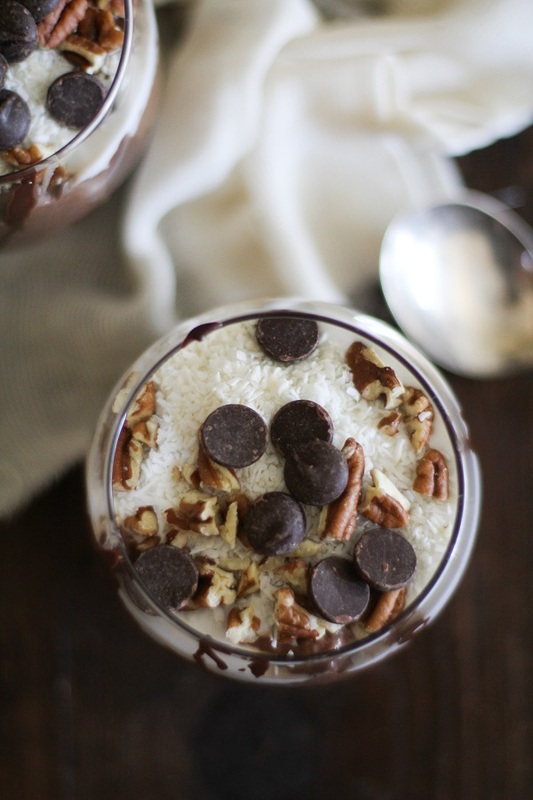 Full-fat coconut milk, almond milk, pure maple syrup, and raw cacao powder make for a creamy and tasty pudding that requires no time at all to make. All you do is shake it all up in a large sealable jar (I used a 2-quart jar ) and let it sit in the refer overnight. You can mix it all up tonight and have velvety rich pudding ready for you in the morning. For the eating. For breakfast. I used Bob’s Red Mill Chia Seeds for this recipe. 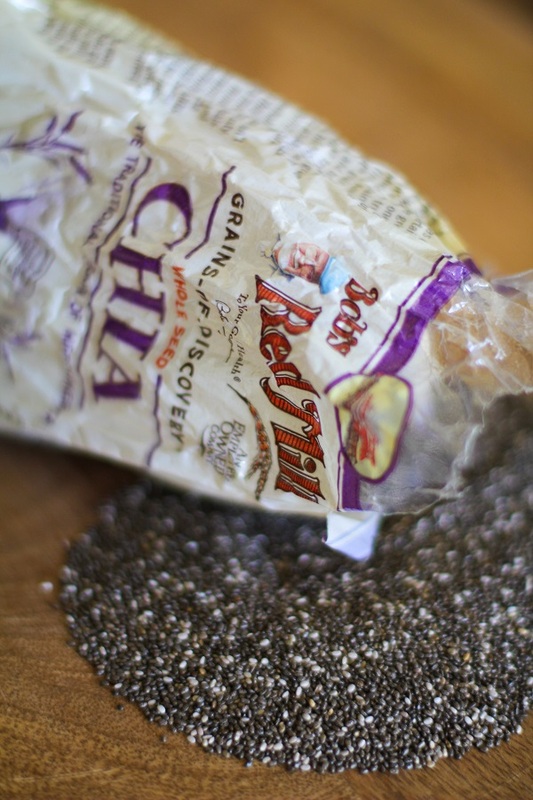 Did you know you can chia with Bob’s Red Mill? I’ve talked about their gluten-free flours quite a bit on account of all the gluten-free pancakes I’ve made over the years. But, newsflash: they chia too! Other than using chia seeds for pudding, you can add them to your salads and salad dressings, oatmeal, granola, smoothies, homemade kombucha, and wherever else you feel so inclined to put them. Remember that Gluten Free Chocolate Cake with Coconut Chocolate Ganache I showed you? I used a little bit of the coconut-chocolate ganache for a little drizzle-swirl action in this pudding. I also served this pudding with chopped walnuts, coconut milk, Bob’s Red Mill’s unsweetened shredded coconut, and dark chocolate chips. Flavors and textures galore!! In a saucepan, heat the coconut milk, almond milk, and raw cacao powder over medium heat. Whisk well until all of the cacao powder chunks have smoothed out and you have a smooth, uniform consistency. This will take a little elbow grease, since cacao powder is stubborn and doesn't like to mix. Remove from heat, add the maple syrup, coffee grinds, vanilla extract, and salt and whisk to combine. Allow this mixture to cool to room temperature. In a large 2-quart mason jar, add the chia seeds and chocolate mixture. Stir well with a long wooden spoon. Seal the container and place it in the refrigerator overnight, or at least 6 hours. I would totally eat this. Here’s a question. If you put these chia seeds on a wet paper towel and keep them damp, would they sprout? Ccccchia! Sorry. This is what happens when you grow up in the 70’s. You have the chia pet commercials run through your head. So many of my favorite things all in one bowl! Always love me some chia pudding! Oh my goodness. What a wonderful chia seed pudding! This is gorgeous! These look so delish! You’re persuading me to try chia seeds. Go for it, Norma! 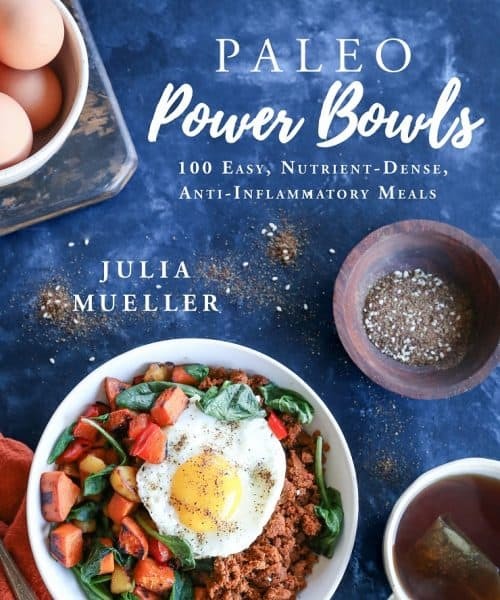 They’re so easy to incorporate into food and great for you! You’re officially the chia master. Haha! Thanks, but I can’t wait to see your jamity chia jam!! I actually bought a choc chia coconutty breakfast pudding the other day and it was that amazing I was dying to try and recreate it at home. Now i dont even need to try and come up with a recipe as you’ve done it for me – thank you! These look amazing! 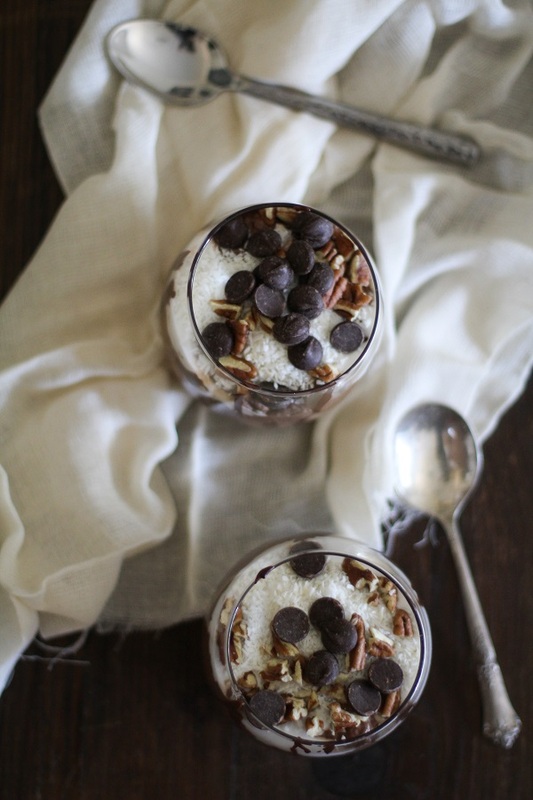 This pudding is right up your alley, Dearna! Let me know if you try it! Oh how I wish I had this for breakfast this morning. But tomorrow, FO’ SHO’. Hope you’re having a great weekend, lovely! I’ll eat this pudding for breakfast every day for the rest of my life!!! 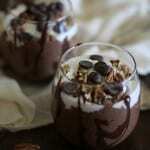 Love this chocolatey healthy goodness! This is my ideal breakfast — can you just be my professional breakfast maker? Tastes like dessert + had coffee + is healthy = perfection! Haha! I’d make you breakfast any dern day! Let’s have coffee and heaping bowls of choco chia pudding! I’m totally due for a selfie fist bump. 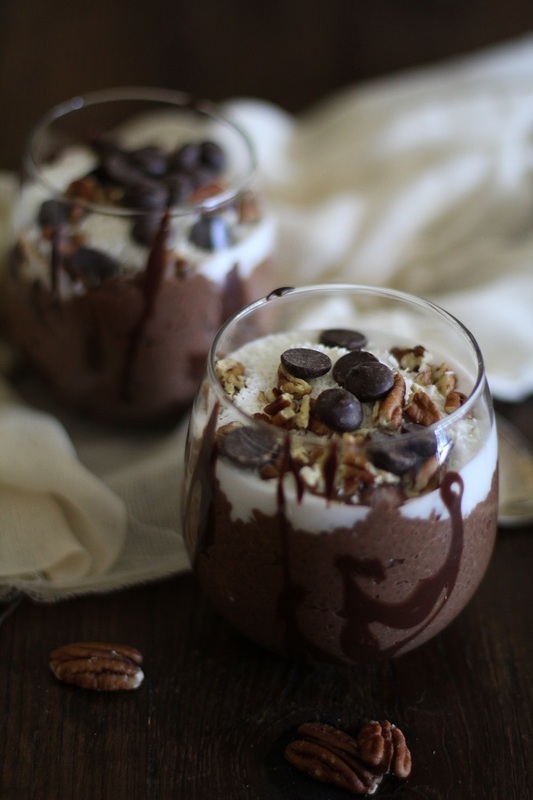 Love this healthy pudding! I have only 10 pounds in my pantry waiting to be made into pudding. This looks fantastic, but for those with nut allergies– any recommended substitutes for the coconut and almond milks? I was thinking the same thing…did you get a response? I didn’t see anything. I was wondering if rice milk would be acceptable. I probably shouldn’t admit this, but I have never tried chia seeds before. I know I’m way late to the party on that one! I feel like I see them in everything, but never know what I should put them in. I also haven’t used coconut milk much. Thank you for opening my eyes to all kinds of new ingredients 🙂 I’m at work now and I can stop staring at this pudding and thinking about how much easier it would be to get through the last hour if I had a big bowl of it to help me! Dessert for breakfast for health. THis is the kind of math I like. This sounds delicious, and I would like to try it. But, I made a China pudding recipe before, and I found the texture of the seeds off-putting. Is it possible to “whiz” the seeds in my spice grinder before adding them? Would that interfere with the gelatinous quality they contribute to the pudding? Sorry – autocorrect has apparently never heard of chia. China, it has obviously heard of…. Yes it works! 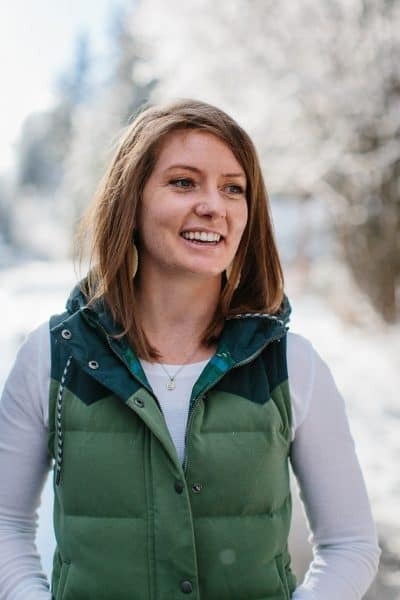 Lol I know this blog post is several months old but I just tried with the ground chia. It gels up in about an hour. There is a bit of texture still but it is a very fine texture. I added a little carob powder and it’s so yum! Add: after 12 hours in the fridge, the texture is almost gone and the pudding is closer to a marshmallow fluff consistency – not chewy but you cut pieces off more than scoop. This stuff is so weird but so cool! Haha! I never would have thought to compare it to marshmallow fluff, but it does get kinda thick, yet fluffy now that I think about it. Chia pudding is its own animal, thanks for sure. Thanks for sharing, Lauren! Oh, thanks so much for posting this! It is gonna help me when I get Chia Seeds at the grocery store! Fantastic! Good heavens, thank you very much for posting this! It is going to help when I order Chia Seeds online! Super Awe Inspiring! This pudding right here… Right here! It’s amazing. Make it. Awww thanks love!! SO glad you like it. I’m definitely trying your blender trick. This was delicious and easy, thank you for the great recipe! May I recommend sifting the cocao/cocoa? It helped with the whisking in, I just shook it through a fine mesh strainer. I’m excited to try a carob variation for my carob-loving sweetie. Thanks! Thanks for the yummy recipe, what are the nutritional values please? Hi Mary, I don’t add nutrition facts to my recipes but have considered doing so moving forward. You can definitely use a free nutrition fact calculator or even MyFitnessPal to calculate the nutrition facts. Many thanks for your interest, and let me know if you make the recipe! I’m really looking forward to making this! Just an FYI: The Bob’s Red Mill website claims that their Chia seed is not gluten free because they don’t make it in their GF facility. This might make a big difference for someone. How many does this recipe feed? Based on a 1/2 cup serving + toppings? No where does it tell you that.